What Causes Motor Oil Consumption? Everyone who owns a vehicle knows you need to regularly check the oil level. (Note: If you do not know this, you’d better go check your oil. and Check your tires too!! Volatility isn’t the only reason you need to replenish your oil supply now and then. The problem of abnormal oil usage is far more complicated and, in fact, most of the causes are mechanical, not lubricant-related at all. Some of the many points where external oil leaks may occur include oil lines, crankcase drain plug, oil-pan gasket, valve-cover gaskets, oil-pump gasket, fuel-pump gasket, timing case cover and camshaft bearing seal. No possible source of leakage should be neglected because even a very small leak can cause extremely high oil consumption. For example, it has been estimated that a leak of one drop of oil every 20 feet is approximately equal to a loss of one quart of oil every 100 miles. 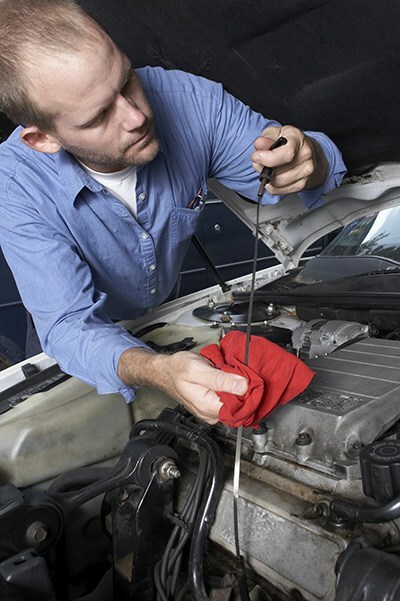 One way to check for external leaks is to road test the vehicle with a large piece of light-colored cloth tied under the engine. Oil on the cloth will indicate a leak, which should be traced to its source. I recently burned a lot of cash trying to get an oil leak fixed. The first task is accurately locating the source of the leak. The problem may be front or rear main bearing seals, worn or damaged main bearings, worn or damaged connecting rod bearings, worn or damaged camshaft bearings, worn crankshaft journals, distorted cylinders, worn ring grooves, cracked or broken ring lands, problems with the wrist pins, clogged oil passages or even unequal tightening of bolts. Sometimes a defective cooling system can cause engine overheating, which may result in localized hot spots in some of the cylinders that can lead to scuffing and scoring of cylinders, pistons and rings, resulting in high oil consumption. If you really want to sink your teeth into it, causes for oil consumption can include too much oil in the crankcase, worn or broken piston rings, improper valve timing, incorrect oil pressure, piston slap, an internal gasket intake breach, spark knock, aftermarket performance chips and modifications, lugging engines, inappropriate operation of overdrive, leaking turbocharger seals, a restricted air intake and fuel dilution. In short, few things are as simple as they might initially appear. When all is said and done, however, even though there may be multiple reasons for oil loss, in a mechanically sound engine it boils down to one: oil volatility. In this matter, synthetic motor oil provides better resistance to oil consumption. If you have a mechanically sound engine, you should be using synthetic oil to reduce oil consumption and to protect your investment. In addition to reduced oil usage, synthetics can reduce emissions and improve fuel economy. During my three decades of writing about oil, I’ve always recommended a synthetic solution. Local note: From our Sioux Falls store staff we hope you enjoy Ed’s blog. We will be posting more from his decades in the industry. It’s our quest to serve and inform Sioux Falls drivers and auto enthusiasts to the highest degree and always provide products which not only out perform but solve problems just the same.